We are offering Steel Pipe Clamps to our client. Riding on immense volumes of market adeptness, we are readily instrumental in the domain of offering to our clients an unbeatable collection of Steel Pipe Clams The material used in its production is obtained from reliable suppliers of the industry after stern quality checks. Additionally, these are dispatched by us in top class grade packing material to deliver these securely. We are a renowned name of the market for Extension Split Steel Pipe Clamp. Our products are enormously admired in the market for their rust proof nature. We are amongst the top manufacturer and supplier of Industrial Pipe & tube Clamps, which are fabricated using high quality raw material and latest techniques . - Can be used for both horizontal and vertical installations. We offer a wide range of stainless steel pipe clamps that are available in grades like AISI-304, 304L, 316, 316L, 321, 316 Ti, 309, 310, 410, 420, 430, 431 etc. (ASTM)-A-176, A-182, A-213, A-240, A-249, A-276, A-312, A-269, A-479 etc. We are offering Steel Pipe Clamp to our client. we have all kind of pipe clamp. We are well known supplier of SS Pipe Clamp. 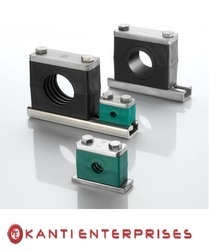 We are well known in the market for SS Pipe Clamp, we provides these products at nominal price. 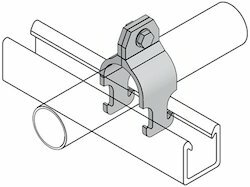 With sincerity and hard work of our professionals, we have carved a niche for ourselves in this domain by providing a premium quality gamut of Steel Pipe Clamp. We are amongst the top manufacturer and supplier of Industrial Pipe & tube Clamps under Brand name TUBE HOLDI, which are fabricated using high quality raw material and latest techniques . MOC for Pipe Clamps as per Customer Requirement .Mainly MS and SS.